The Space Programmes Unit (SPU) operates under the General Directorate of the "AΤΗΕΝΑ" Research and Innovation Center in Information, Communication and Knowledge Technologies. The principal objective of the Space Programmes Unit is to foster participation of Greece in all aspects of the countryís membership in the European Space Agency (ESA) and assist the nationís competitiveness by advancing the use of leading-edge technologies in space engineering and science in the national, European and international domains. The Space Programmes Unit, as part of the General Secretariat of Science and Technology, advances the GSRT agenda of public service through research, technological literacy, and the application of knowledge to the nationís affairs. 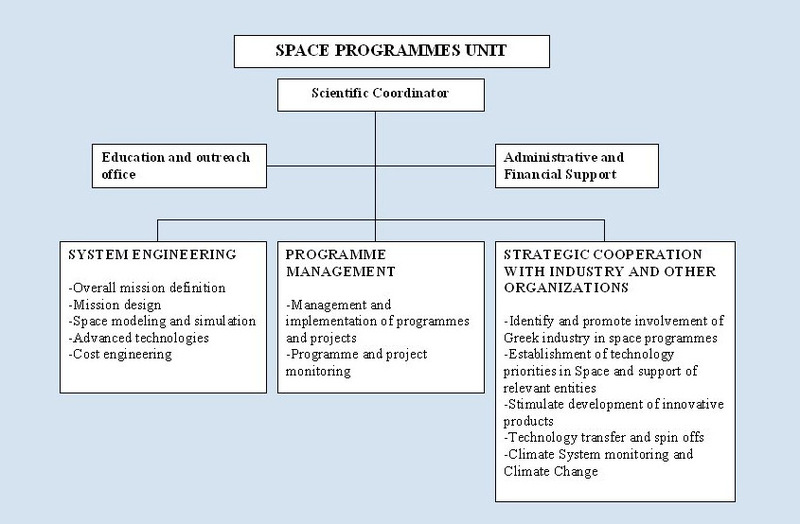 The principal thrust of SPU is to marshal the high technology, intellectual, entrepreneurial, and institutional resources available within Greece in pursuit of programs and projects relating to space activities that have the potential of high payoff in the technical, defense, economic, and commercial arenas. Emphasis is placed in promoting involvement of Greek industry in space programs of interest, stimulating development of innovative programs, and effecting technology transfer to a level where potential spin-offs opportunities may be created. System Engineering is a core capability and includes mission design, modeling and simulation, and cost engineering, among other competencies. Program management, implementation, and monitoring round out the Unitís discipline mix. To attain these objectives, SPU is organized into three areas: System Engineering, Program Management and Strategic Cooperation with Industry and Other Organizations. It is a non-civil service, not-for-profit organization within the Athena Research Center. The emphasis in staffing is for highly capable engineering and science personnel, assigned to the areas of System Engineering, Program Management and Strategic Cooperation as well as to the Education and Outreach office.